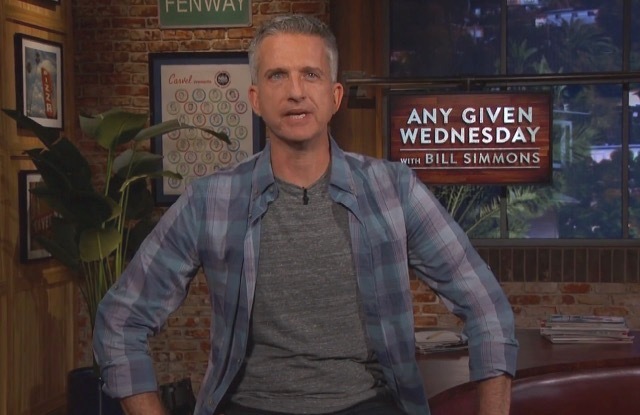 HBO has set a high standard with the title sequences for Real Time with Bill Maher and Last Week Tonight with John Oliver, so the intro for Any Given Wednesday with Bill Simmons had to meet that bar. Though the music might not have been as immediately catchy, it set an upbeat, folksy tone for the show. More important were the items floating on the screen during the sequence, virtually all of which were sports-related. There was a basketball, a football helmet, a baseball mitt, even a copy of Simmons’ The Book of Basketball — just in case you weren’t sure who’s hosting this show. All of those objects — gym shoe computer keyboard, tennis racket, headphones, carousel projector — eventually come together, like a garage being emptied, presumably representing the mind of Simmons and scope of the show. 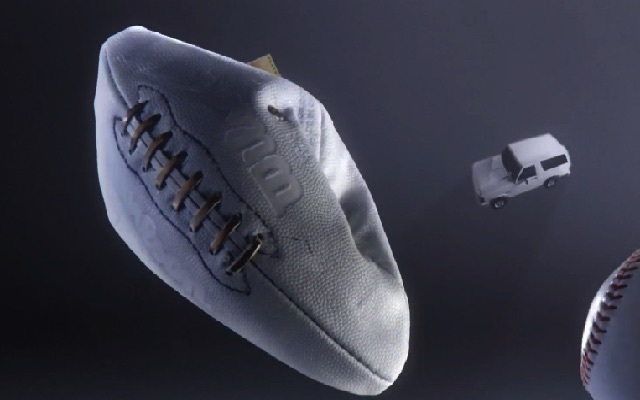 The most notable item, of course, was the deflated football. Oh, very cheeky. And a precursor to the most memorable part of Any Given Wednesday‘s debut episode. The show began a bit awkwardly as Simmons jumps right into a commentary about LeBron James without formally introducing himself to the audience. But maybe that was the right way to go. Everyone tuning in likely knows who Bill Simmons is. Let’s see what this show is all about. Simmons seemed a bit uncomfortable on camera at first, reminiscent of 30 Rock‘s Jack Donaghy not knowing what to do with his hands. But the camera smartly didn’t dwell too much on him, providing enough time to appreciate Any Given Wednesday‘s cool set before showing clips of LeBron to illustrate Simmons’ point that this NBA championship legitimizes James as one of the game’s all-time greatest players. It was a timely, snappy commentary, punctuated by highlights, pictures, a clip of Teen Wolf, and just to remind everyone that this is HBO, Simmons dropping the f-word. This was not going to be Bryant Gumbel sitting on a leather chair, crossing his legs and holding his glasses like he is telling you something very important. This was fun. That served as prologue to Simmons’ interview with Charles Barkley, in which the former NBA star and TNT analyst disputed the claim that LeBron was now one of basketball’s all-time top three players. The conversation was casual and informal, just a couple of guys talking basketball. Barkley’s attempt to paint Simmons as some young whippersnapper whose only frame of reference was the past 10-15 years was amusing. The look on Barkley’s face when Simmons pointed out that NBA players didn’t play much defense in the 1980s was particularly entertaining. Nearly 10 minutes long, the conversation (or setting) wasn’t much different from what Simmons used to do on The B.S. Report podcast, and that experience paid off here. Some have found it curious that Any Given Wednesday isn’t being taped in front of a studio audience, but that seems like the right decision. No one’s playing to the crowd. Audience reaction isn’t taking sides or interrupting any statements. There’s just a little bit of laughter from the production crew when needed. The best part of the show was Simmons’ feature on Stephen Curry, and how the one thing that might be keeping him from becoming a transcendent NBA star — like Barkley, Michael Jordan, Larry Bird or Magic Johnson — is his lack of a great commercial thus far into his career. Curry’s Under Armour ads, in particular, don’t display any personality or show that he doesn’t take himself too seriously. And his profile suffers because of it. Where’s the joy? This wasn’t a Curry vs. LeBron argument. Simmons wasn’t ripping his performance in the NBA Finals, though Curry’s failing composure as the series slipped away was notable. How does Curry recover from reaching great heights, only to fall to embarrassing depths? What does he need to do? It was a fun, creative angle to take on what’s sure to be a frequent talking point throughout the summer. Sure to be a frequent topic for the rest of the week is Simmons’ interview with Ben Affleck. Simmons demonstrated that he’s a skilled interviewer by getting Affleck to candidly talk about how embarrassed he was about his career before he reinvented himself as a serious director. But once the two New England Patriots fans began discussing DeflateGate and Roger Goodell’s personal vendetta against Tom Brady, the conversation devolved, largely due to Affleck’s increasingly angry, f-word filled rant. It’s too bad they couldn’t stick to comparing the 2007 Patriots to the 2016 Golden State Warriors, two teams that had historic seasons that ultimately fell short of greatness. But Simmons has been defined to an extent for his feelings on DeflateGate, and Affleck clearly relished the opportunity to vent his frustration with a fellow fan, even if he was perhaps a bit too aware that this was happening on HBO. 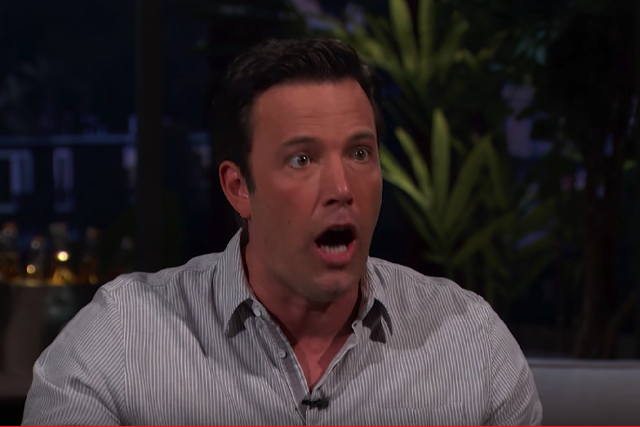 Many viewers thought Affleck was drunk, as he occasionally slurred words and was becoming more incoherent as his rant progressed. I’m willing to believe that Affleck was possibly a bit slap-happy and jet-lagged, presuming that he flew in from the London Justice League set to chat with Simmons. (I want to believe in Batman!) But his tirade (and love for Brady) could certainly have been fueled by some liquid encouragement. Fortunately, Any Given Wednesday‘s first show didn’t end with the Affleck interview. Imagine Simmons signing off then, after he basically wound up Affleck and let him go, while sitting back in amusement and surprise. The show instead ended with another commentary, this one about how unpredictable 2016 has been in sports and pop culture. As Simmons becomes more natural on camera and producers find their comfort zone, this final segment will surely become smoother and even more enjoyable. Regardless, it was the right note to end on, mixing sports and culture seamlessly, and maintaining the fun tone of the show. If the idea was to adapt Bill Simmons’ sensibility to television, Any Given Wednesday accomplished that. It might take a few episodes for this to feel like must-watch TV, but the show could get there, based on what we saw in its premiere.